Beginning this Friday, The Weinstein Company will begin rolling out Quentin Tarantino’s “The Hateful Eight” in an exclusive 70mm roadshow format. While most of the country has to wait to see the film until its general release on December 31, cinephiles in the 44 roadshow markets across the U.S. and Canada will get a holiday gift like no other. Not only will the Western be projected on 70mm film as envisioned by Tarantino, but the roadshow also includes an overture, intermission, seven minutes of additional footage and a limited edition program. For a director who has much respect for cinematic history, this roadshow is as close as Tarantino has ever gotten to restoring the glory days of Hollywood. Throughout much of the 1950s and 1960s, the big epics were released in roadshow presentations, which often toured the country and included reserved seating. These films were shot and projected on film, using a variety of formats such as Super Panavision, Ultra Panavision and Todd-AO that were all designed to project highly detailed 70mm widescreen photography. “The Hateful Eight” uses Ultra Panavision; shot on 65mm and projected on 70mm, it holds a super-wide aspect ratio of approximately 2.75:1. The roadshow format has been dormant for over four decades now. As “The Hateful Eight” roadshow enters its final prep phase before its big Christmas release, here are 9 of the most essential classics that paved the way for the cinematic roadshow. Fred Zinnemann’s soaring film adaptation of the 1943 stage musical was the first feature film photographed using the Todd-AO 70mm widescreen process, resulting in a big, bright and beautiful image that brought the depth and scope of the theater stage right onto the movie screen. Starring Gordon MacRae and Shirley Jones as cowboy Curly and farm girl Laurey, the movie brings a lush cinematic sheen to many of the show’s most iconic numbers (i.e. filming “Oh, What a Beautiful Mornin'” against the dreamy rustic backdrop of green pastures and blue skies). In its original theatrical release, the movie was distributed as both a cinematic roadshow (or the 70mm version) and a general release (for 35mm), and the roadshow was designed in the tradition of the musical, playing two shows a day, both with intermissions. Even taking today’s mega-blockbusters into account, few films in movie history are as humungous as Cecil B. DeMille’s biblical epic “The Ten Commandments.” The most expensive film ever produced at the time of its release, the movie also featured some of the largest sets every created for the big screen and is still the seventh highest-grossing movie of all time when adjusted for inflation. Shot in high resolution VistaVision with Technicolor color correction, the epic is an eye-popping work of ambition and old school spectacle. Charlton Heston and Yul Brynner famously take on the roles of Moses and Ramses, respectively, in this dramatized account of the former’s journey to free the Hebrew slaves and embark on an exodus to Mount Sinai. Before its 1958 general release, the movie played in a reserved-seating roadshow format for two years. Inspired by the success of “The Ten Commandments,” MGM turned to star Charlton Heston and director William Wyler to create another epic swords-and-sandals adventure, and the resulting “Ben-Hur” was an even greater success story. The story of a former Jewish Prince who rises from slavery to battle the Roman empire, “Ben-Hur” is one of the biggest productions of all time, with 200 artists working on costumes, statues and props, plus 200 camels, 2,500 horses and 10,000 extras being used on set. Because Wyler and cinematographer Robert L. Surtees were directed by MGM to shoot the film in widescreen (which Wyler initially opposed, citing it would result in too much unused screen), they collaborated on the “MGM Camera 65” process, which used special 65mm film stock with an extremely large 2.76:1 aspect ratio. 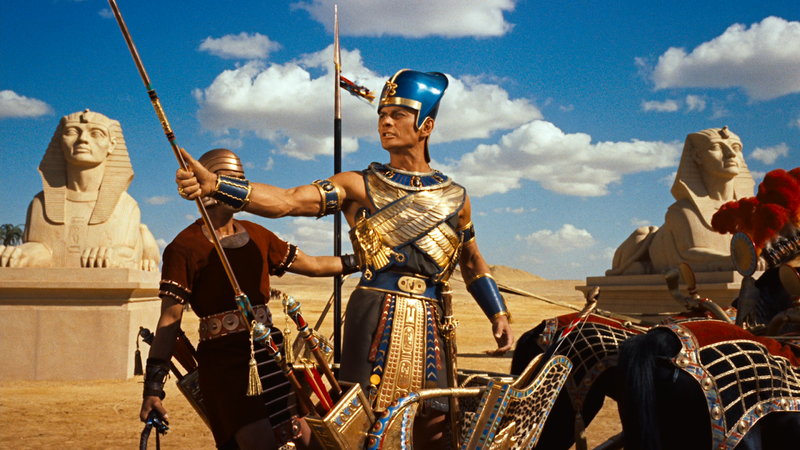 The format proved essential for the movie’s centerpiece: A nine-minute chariot race in which the widescreen captures the racers in the frame all at once. The highest-grossing movie for a decade, “Spartacus” was one of Stanley Kubrick’s earliest epics, even if he would go on to disown the film. Starring Kirk Douglas in his most iconic role, the movie is based on the real life of a slave turned rebel leader during the Third Servile War. In order to film the movie’s large panoramic scenes with as much detail as possible — including multiple battle scenes filmed in Spain — the director and studio opted for the 35mm Super 70 Technirama format, which would be blown up to 70mm film during projection and exhibition. Before it was circulated in both 70mm and 35mm prints, the studio issued an exclusive 70mm roadshow that used six-track stereophonic sound, similar to “Ben-Hur.” The roadshow played for over 70 weeks in cities like New York, Boston, Chicago and San Francisco. David Lean’s historical epic is one of the most stunning feature films ever made, with F.A. Young’s jaw-dropping widescreen camerawork representing some of the best cinematography the medium has ever offered. Shot using Super Panavision 70, the lenses capture the massive expanse of the desert, often drowning out Peter O’Toole and the other members of the ensemble in a sea of scorched landscapes. Chronicling T.E. Lawrence’s WWI experiences in the Arab Peninsula, the roadshow was presented in two distinct parts separated by an intermission, with the first half largely devoted to Lawrence’s emotional struggles and the second depicting the various battles he undertook as the leader of a guerrilla rebellion. Stanley Kramer’s star-studded epic comedy is an eye-poppingly colored, madcap adventure about a diverse group of strangers who come together in order to locate $350,000 worth of stolen cash. Thanks to one of the most ingeniously constructed chase scenes in movie history, “It’s a Mad, Mad, Mad, Mad World” makes full blown use of its title in every character and ambitious comic set piece. Famously, the comedy was promoted as the first film to be produced using “one-projector” Cinerama, as opposed to the more traditional “three-projector” version. In doing so, the movie was able to be exhibited using Super Panavision or Ultra Panavision, which gave an extra anamorphic compression to the edges of the image in order to create the 2.75:1 aspect ratio. The hills were alive and more humungous than ever when “The Sound of Music” opened in its select roadshow format in 1965. The essential film adaptation of the 1959 musical, the movie stars Julie Andrews as Maria Von Trapp, a young Austrian woman studying to become a nun who takes the position of governess to a widower’s seven children. As timeless as the music is, the stunning widescreen photography captures the heart and soul of this faith-based story. Because of the sweeping locales and large ensemble, director Robert Wise filmed the musical using Todd-AO 70mm film and edited it with DeLuxe Color processing. Todd-AO provided the same benefits as Super and Ultra Panavision, mainly crystal clear widescreen photography. David Lean knew an ambitious epic when he saw one, making him perhaps the only director who could successfully tackle Boris Pasternak’s grandiose novel of the same name. Featuring the immortal pairing of Omar Sharif and Julie Christie, the film presents an epic romance that plays out in the years leading up to World War I and the Russian Civil War, a time of mounting political rebellion, hostility and strife. The widescreen photography helps facilitate one of Lean’s major thematic strands — the duality of Russia’s rural vs. industrial complex — and is truly vital in depicting the massive scope of the Russian landscape. Although Lean wanted to shoot the film in Super Panavision, MGM refused his wishes as to keep the movie’s production cost down. The director filmed the epic using standard 35mm Panavision anamorphic lenses, though the prints were blown up to 70mm for the roadshow. Stanley Kubrick’s magnum opus is largely credited as the most essential moviegoing experience, in large part due to its landmark Super Panavision photography. The original roadshow release, complete with one of the most terrifying overtures of all time, used a six-track stereo magnetic soundtrack and was projected in a 2.21:1 aspect ratio on a curved Cinerama screen. The movie had its world premiere on April 2, 1968 in Washington, D.C, kicking off one of the largest roadshows in movie history. Nearly all of the initial reserved-seating screenings were sold out, and the movie played for over a year in numerous markets (it played for 103 straight weeks in Los Angeles alone). The film continues to tour as a 70mm roadshow to this day, making it one of the must-see moviegoing experiences that you can still check out for yourself.